Degrees for dreamers, doers, and leaders. You’ll develop the knowledge and skills to help you succeed in any environment, anywhere. Find the right combination for your goals majors and minors to achieve your goals. 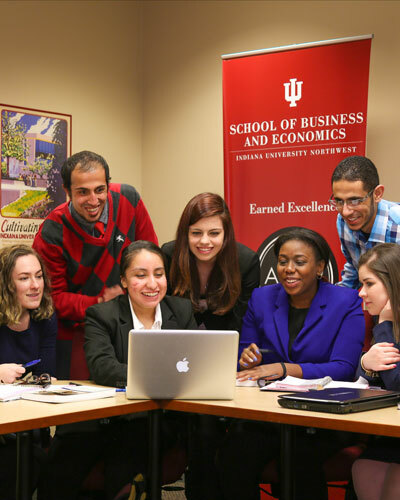 Affordability, small classes and unique learning experiences set IU Northwest apart. Students studying Business Administration can use their degrees to start careers in just about any industry, including healthcare, financial services, information services, marketing manufacturing, banking, and human resources; or, use it to prepare themselves for an advanced degree in law or business administration (MBA). Students studying Accounting/Financial Information Systems can use their degrees to start careers in various industries, including banking, financial services, public accounting, government, financial services, and healthcare. Students may also apply in their senior year to take the CFM or CMA exam upon receipt of their degrees. Make time to join a club and attend events. The more you participate, the more you gain. The School of Business and Economics has a variety of student organizations where students can pursue your interests in various fields of business.